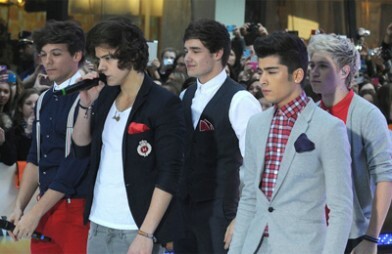 One Direction are launching their own perfume. The boy band – made up of Niall Horan, Harry Styles, Louis Tomlinson, Liam Payne and Zayn Malik – have teamed up with Olivann Beauty to create a women’s scent, which will be available next year. The company – a spin-off of Fusion Brands Inc.’s Luxury Fragrance Division – has been working on the concept for around six months and the perfume will launch globally in late 2013 at various department stores. Dana Kline, president of Olivann Beauty, told WWD they will first concentrate on markets where the band is touring and then continue to roll out from there. More details, such as the name, will be released early next year. One Direction are not the first pop stars to bring out their own fragrance. Fellow British boy band JLS recently released their first perfume, while Justin Bieber, Britney Spears, Jennifer Lopez, Christina Aguilera and Katy Perry have all enjoyed success with their scents.